“soratama SP” is a device which enables your smartphone to take soratama pictures. Until now, soratama pictures were only available with DSLR. With “soratama SP” you can also enjoy the unique photograph with your smartphone. All parts are assorted in this compact body to photograph soratama pictures. “soratama SP” was created by GIZMON, which is well known for its products for mobile phones, and ZENJIX, the manufacturer of soratama. “そらたま”,“宙玉” and “ZENJIX” are trademarks registered by Maminka. It has been already registered or has been applied for in Japan, China, USA, etc. By using the smartclip which is included in the package, “soratama SP” can easily and quickly be fixed onto the smartphone. Extension tubes and macro filters are not needed. Soratama pictures can be taken with this simple structure. “soratama SP” uses ball lens made of optical glasses, and coated glass plates. The metal lens body is matte coated in order to reduce the occurence of flare. In order to correspond to different focal distance of many mobile devices, three extension tubes are included in the “soratama SP” package. Not only iPhones and Adroid smartphones and tablets but it can also be used with many devices with camera function. 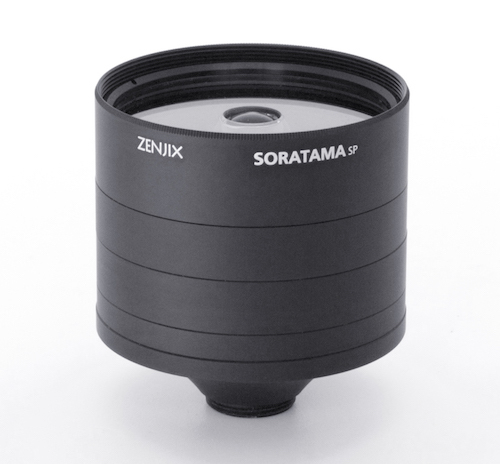 Soratama is a lens filter for digital single lens reflex cameras which provides a special effect to the pictures. The clear ball fixed in front of the lens makes it possible to photograph sceneries in a ball, flowing in the air. It is loved by many photographers these days. An experimental photographer. Exploring the wonders of photography by experimenting and releasing equipments such as kaleidoscope camera and Vibration amplifying device. Soratama was created in 2009. It has been made into a product and is loved by many photographers around the world. Below are photos taken with “soratama SP”. ※180 degrees turn and trimming process are done by camera application. Follow gizmoshop’s board soratama SP on Pinterest. This device is a delicate optical equipment. Do not drop or apply an impact. Do not get too close to the object when photographing. It will loose the focus. When the image gets vignetted, use the zoom function or trim the edge of the image with camera application. The image will come out wrong way round by only using this device. By using the camera application on your smartphone, 180 degrees turn and trimming process can be done. Fix the device onto the wide angle camera when using iPhone 7 Plus. Click the link below to see applications which enables to take photos in correct direction when taking photos with “soratama SP”.